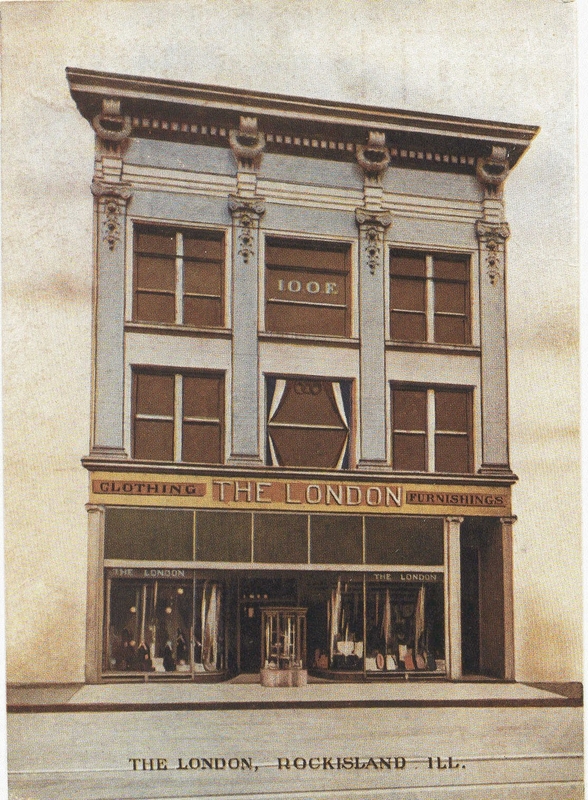 After the London closed in the teens, S. S. Kresge Co moved into the street level floor and the upper stories were rented to Fidelity Loan Company and Brown’s Business College, who occupied it at the time of the fire. The fire was discovered near midnight by a railroad switchman who smelled smoke as he passed by. Believed to have started by “crossed wires” in the basement, it then “roared through” a first floor stock room. Even filled with firefighting water, part of the east basement was still burning the next day. The loss was reported at $150,000 of which $75,000 was damage to the London Building. The remaining costs included damage to merchandise and equipment inside the London as well as damage to adjacent buildings. Although Kresge merchandise was a complete loss, the records inside the Fidelity Loan Company’s safe were unharmed despite a two-story fall to the basement. Mosenfelder’s, the store to the west, wasted little time advertising a smoke sale of their merchandise. Four days later on January 10, the building’s owner, J. R. Sax of Ottawa, announced his intention to rebuild, noting that the walls were in good condition and that only the interior would need to be reconstructed. (We don’t know if J.R. Sax is the same as Jacob B. Sax or was a son.) However the building inspector said that only a portion of the walls could remain. 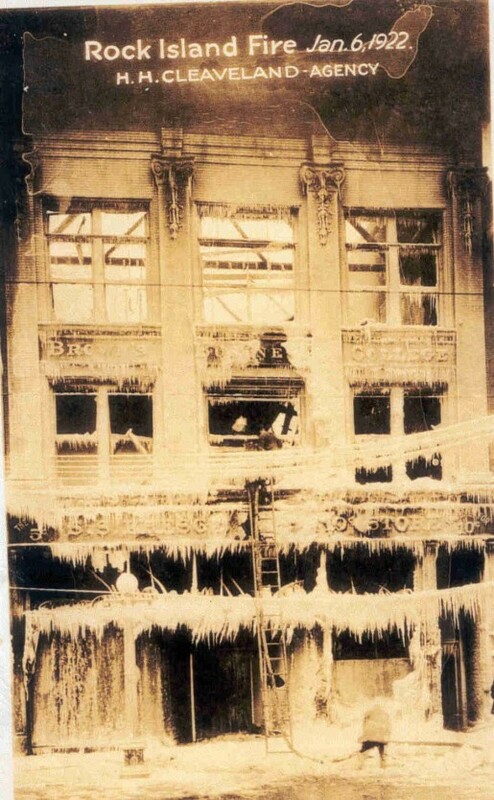 By this time, the cornice, which had been supported only by the ice surrounding it, had been removed and other dangerous building parts had been torn away. Mr. Sax was undeterred and said the building would be ready for occupancy in four months. 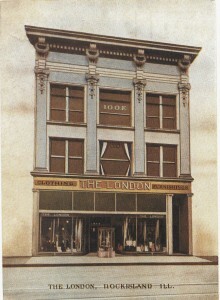 A colored postcard, dating from circa 1910, shows the building before the fire. An Argus caption for a photo of the restored building said of this phoenix, “handsome apparel store rises from ruins of most disastrous fire in Loop District.” Although the interior was updated, very few differences between the fire photo and the rebuilt store can be spotted. The original twin double hung windows and transoms we see on the fire picture were updated to a newer style with three glazing panels plus transoms at each opening, very similar to what is there today. The storefront level was modified as well, changing from the single wide store entrance and right side stairway entry to three wide symmetrical display windows framing a pair of recessed doorways. And Mr. Sax saw to it that the original “big blue” front of the building was restored, complete with cornice and all of the decorative trim. The striking blue and white colors come from a thin fired glaze, just like that on dinnerware, atop heavier clay backing, some of which is molded in ornate patterns. The first occupant of the restored building was Mosenfelders, Inc. In subsequent years, retail businesses there would include J. A. Mosenfelder, Waxenbergs, Block & Kuhl, and The Fashion. For the past decade, it has been the home of Quad City Arts on the first two floors and Gere-Dismer Architects on the third. Why the postcard? Although the H. H. Cleaveland Agency only carried $9500 of the total $36,750 insurance on the building, it probably issued this postcard after the reconstruction was complete so folks could compare the “before” and “after.” What better advertisement for insurance than a building restored after such devastation. The firm was founded by Wm. H. Hayes and Capt. H. C. Cleaveland in 1868 and was taken over by H. H. Cleaveland in 1899 after the death of his father. The descendant of this old company can still be found downtown today, not far from its original location. One more item – there is a “Victorian” style electrical streetlamp in front of the burnt building. Several weeks ago, we questioned whether they actually ever existed on our downtown streets. Clearly they did, but later than expected. Thanks, Mr. Sax. Your London Building is still an exquisite monument to historic preservation. This article by Diane Oestreich is slightly modified from the original, which appeared in the Rock Island Argus and Moline Dispatch on November 16, 2003.